If you are unfamiliar with Van Adams it’s not a surprise, but you may be familiar with their former identity as Villains, or not. This is the indie electronica duo of Yvette Adams and Ivan Hernandez. As Villains they had a drummer, and now they have a drum machine and a lot more synths going on–somehow, no strength is lost, in fact they’ve gotten stronger and stranger in one fell swoop. I fell in love with this duo at the start of this year and have been hounding them since for a release and it’s finally here. There are many surprises in this release as they become an entirely new entity. One of the most surprising is that while watching Villians become Van Adams in live performances it was Adams on vocals and keyboards, while Hernandez laid down some stunning guitar work across the entire thing. The things that stood out were Adams immaculate voice that shone like beauty beyond all reason and Hernandez’ amazing rock guitar work providing an earthy contrast to the electronic happenings. With Van Adams the guitar is inexplicably gone, just surprisingly gone as far as I can tell. On this EP it is entirely a showcase for Adams vocal beauty with a variety of electronic backdrops that can be endlessly mixed for dance floor remixes. 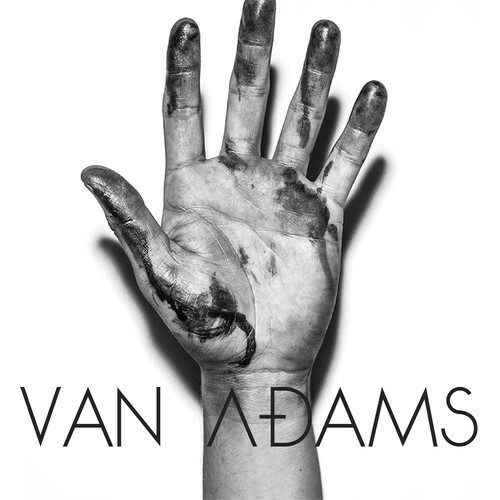 Here Van Adams present four amazing club ready numbers with astounding vocals, as they have re-imagined themselves and it is beyond the indie rock scene, more toward an eye toward Euro Disco or at the very least LA. There are moments of beauty and brilliance throughout it, but it’s best taken as a whole, though they may want to think about licensing their music to television shows, especially in the UK, specifically “Siren” and “Neighborhoods”. The EP kicks off with “Old Flame” which immediately shows off the vocal gymnastics of Adams in no uncertain terms, as well as the bombastic electronica approach that the band has decided to take. I want to make this clear, Yvette’s vocals has always and will always just bring me to my knees. In this incarnation they are definitely taking a more pop/dance approach, but no matter what her voice will hold your rapt attention. “A Song Called Wolves” is so dance heavy that it draws away from Adams’ voice, but that seems to be the purpose. It’s one of the more fascinating numbers lyrically, while musically it is best enjoyed on cocaine or ecstasy. No joke. “Siren” is one of the strongest songs here, not only for the vocals and the lyrics, but for the amazing rhythms and construction. Yes, I wish the drums were reeal throughout, but I will take what I can get from this promising duo. There is a little too much dubstp backdrop here, but somehow it doens’t take away from whaat a brilliant song it is as a whole and the music box ending is stallar. The finale of “Neighborhoods” is possibly the best song on the entire affair and certainly the best constructed. This should clearly be the single, but they need an edit as the near five minute runtime is prohibitive for radio, but these two are clever and cam cut it down with ease. This is the track that sticks upon multiple listens and it is a great way to end the EP. Every song here is a showcase for the many shades of Adams’ voice, which is what it is supposed to highlight–here is an amazing vocalist singing at her prime and it is resplendent. It will be fascinating to see where they go next. It’s not the band I fell in love with a year ago, but it’s a band I could definitely dance to in the right club on the right drugs all night long. It is certainly a new beginning. Just listen for yourself.